You may have noticed that vermouth has been creeping into my recipes over the last few days… A bottle had been bought for use in cocktails, but however noble a use that is, it takes a lot of martinis to get through an entire bottle! So I’ve been adding it to recipes as well. I’m using vermouth instead of the red wine of course, and I’ve added some different flavouring, going for a warmly spicy smoky flavour. 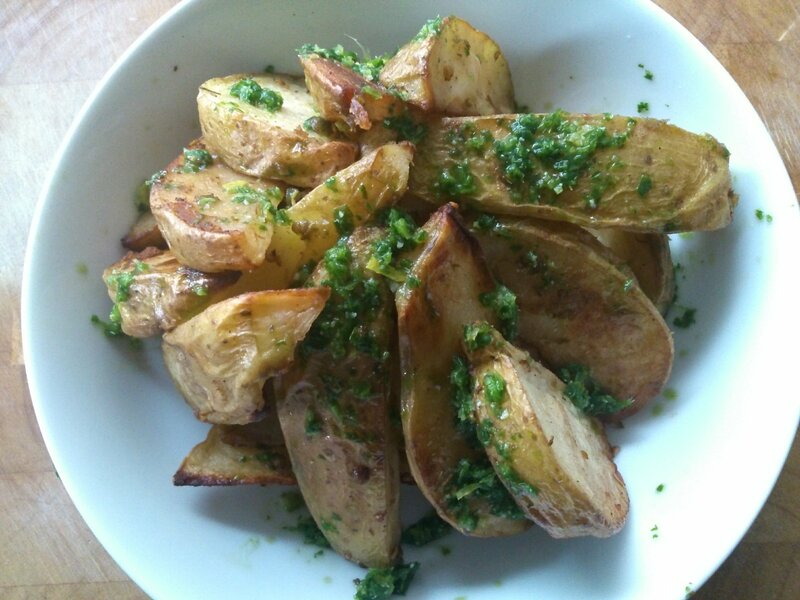 The resulting wedges have a gorgeous flavour, and are very moreish! I served them with the herb sauce from yesterday’s recipe. Crush the coriander seeds together with the thyme and salt using a mortar and pestle (or put them in a clean tea towel and bash with a rolling pin). Tip the oil, potatoes, and coriander mix into a large roasting tray. Mix well so that the potatoes are well coated in oil and the herbs and spices are evenly distributed. Roast for 30 minutes, turning half way through. Mix together the vermouth, allspice and liquid smoke and tip it over the potatoes, mixing well. Roast for a further 20 minutes until the potatoes are golden and beautifully fragrant.